What is the CAKE Dynamic Click Pixel? What is the difference between Static and Dynamic Click Pixels? 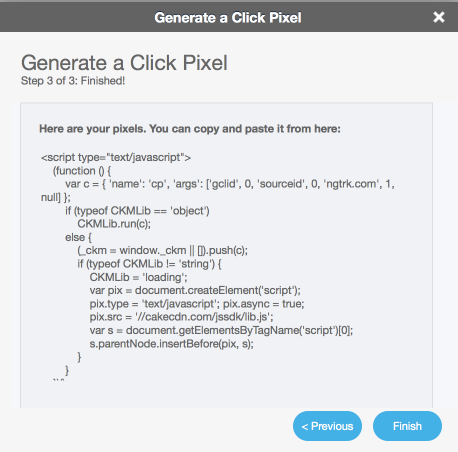 A static click pixel is a campaign specific piece of code that will track a click from a user when they land on a page. Since it is hard coded to a campaign, this type of pixel is typically given to third party affiliates that may host a landing page for you. 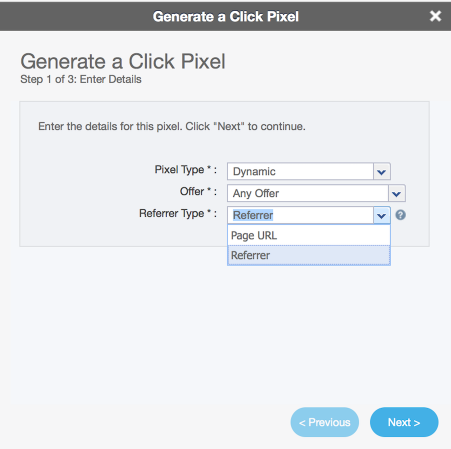 Dynamic click pixels have the ability to reference specific attributes in the page URL or referring URL to determine which of your campaigns to attribute the traffic to. When do I use the CAKE Dynamic Click Pixel? 1. When you're buying keywords from search providers and would like to track those visitors. Which Channels leverage the CAKE Dynamic Click Pixel? If you are using the CAKE for Advertisers platform we encourage you to use a Dynamic Click Pixel for all landing pages on your site for tracking all of your sources. The one exception to this is for your Affiliate traffic. While it is possible to use a Dynamic Click Pixel for tracking Affiliate traffic, we recommend using a CAKE tracking link which will give you the ability to actively redirect the user based on many different criteria. How do I Create a CAKE Dynamic Click Pixel? Choose Dynamic as your Pixel Type. Select either Any Offer or a Specific Offer. Note: When would you choose Any Offer over a specific Offer? 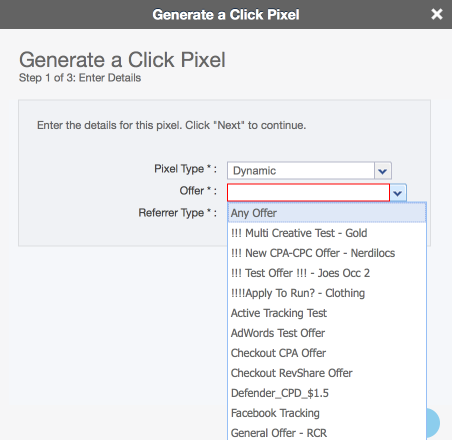 If you choose "Any Offer" the dynamic click pixel will search all campaigns across all Offers to find the matching attribution parameter values. Referrer Type: Your selection will determine what populates within the Referrer column in your Reports. Referrer is the webpage address that linked to the click pixel page. Campaign Referrer Mapping will be based on the Referrer type selected here. For this reason, you will want to choose Referrer as this will allow you to utilize Referrer mapping. If you are placing this pixel on a 3rd party landing page you will want to use the Page URL to verify the URL that the pixel is on. For information on Referrer Mapping, please click visit the Search Integration Documents. 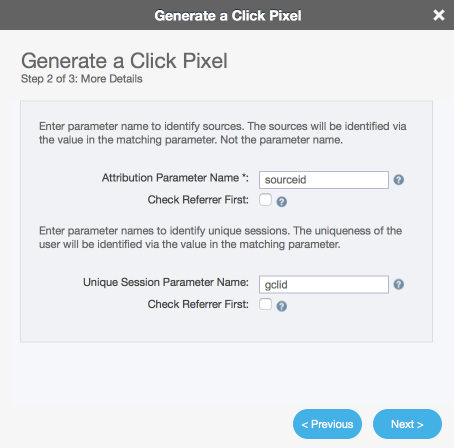 Attribution Parameter Name: Campaigns will be identified via the value in the attribution parameter defined here, not the parameter name. Insight: How do we do this? Map the value at the Campaign level in a field called "Third Party Name"
When driving traffic to your webpages through multiple traffic providers, you will want to pass a unified attribution parameter within your URLs. If you do not already have a specified source parameter, simply append a new unified parameter to all of your URLs. Check Referrer First will be used if you chose Page URL as the Referrer Type (on the previous step) for reporting, however, your attribution parameter is within the referring URL. This typically only works for Google AdWords campaigns and not Bing Ads. CAKE identifies a user's session based on a cookie. However, Google identifies sessions based on a unique value passed within their URL once an AdWord is clicked on. To account for a new Google session, CAKE will identify the unique value within the gclid parameter. The AutoTagging setting in Google Adwords must be enabled to pass the gclid parameter on the URL. Note: If CAKE identifies the same Google session value twice or more, the CAKE dynamic Click pixel will not fire again. 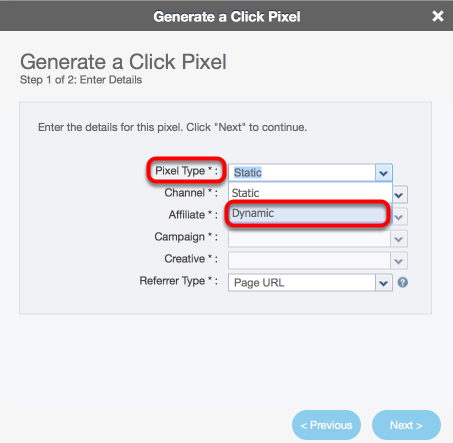 Essentially, the Dynamic Click Pixel has its own deduplication methods so that CAKE can be aligned with Google's Adwords charges. Check the box to Disable Click Deduplication on the Offer Card > Attribution Tab. This will allow clicks from all Sources to be considered unique so you can view attribution across all Channels. If you are using the Affiliate Channel and driving traffic through tracking links to your website while also leveraging the Dynamic Click pixel you will need to append ckmreqid=#reqid#&ckmat=1 to all of your Landing Page Links. 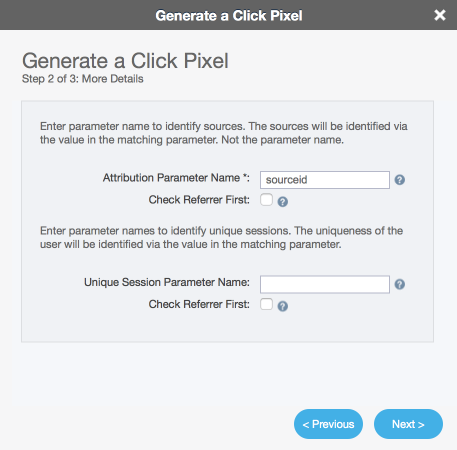 This will tell the Dynamic Click Pixel that a session already exists for this user based off of the Request ID value being passed in on the click. How do I Integrate Bing Ads? How Do I Import Google AdWords into CAKE?